Strangulation is a form of death due to asphyxia. Suicide by ligature strangulation is rare & very unique. In suicidal strangulation, the signs of venous congestion are very well developed above the ligature mark. The above said feature is seen where the ligature is twisted several times round the neck, which is followed by a knot. In suicidal strangulation the marks of violence, struggle on other parts of the body are rare and as a rule absent. The following is an unusual case of suicidal strangulation where the victim maintained pressure over neck by pulling the ligature with his left hand. Scene of a crime, relative position of body, absence of violent marks/struggle marks, entangled thread within the grasp of the deceased's hand, past history of suicidal attempt and mental condition of the deceased assisted in arriving at the manner of death. World Health Organization mortality data found that hanging was the most common method used for committing suicide in most of the countries . Literature search suggests that the suicidal hanging is the most common method used in India. Self-strangulation by ligature is uncommon . Strangulation is a type of mechanical asphyxia produced by constriction of the neck by ligature material, without suspending the body . Most of the strangulation deaths are homicidal in nature. Accidental and self-strangulation death are very rare to meet in practice. In the case of suicidal strangulation, there will be no signs of struggle & resistance, the neck including the laryngeal cartilages will not show injury and thus can be differentiated with homicidal strangulation where injuries to the neck musculature are more . 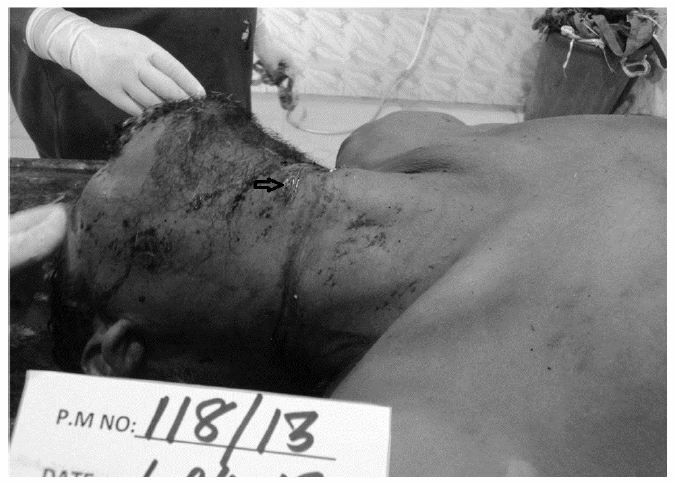 Attending the scene of crime, examination of the neck with respect to the pattern, course, position and the method as to how the two free ends of ligature material has been fixed to create constant pressure and constriction of the neck, absences of injuries to other parts of the body, previous history of deceased helps in determining the manner of death. On the perusal of inquest submitted by the investigating officer, the deceased a chronic alcoholic was found in an open field with ligature material present in situ around the neck (Figure 1). The free end of the ligature material was twisted within fingers of his left hand the hand was stretched away from the torso (abducted), made out from the presence of rigor mortis. 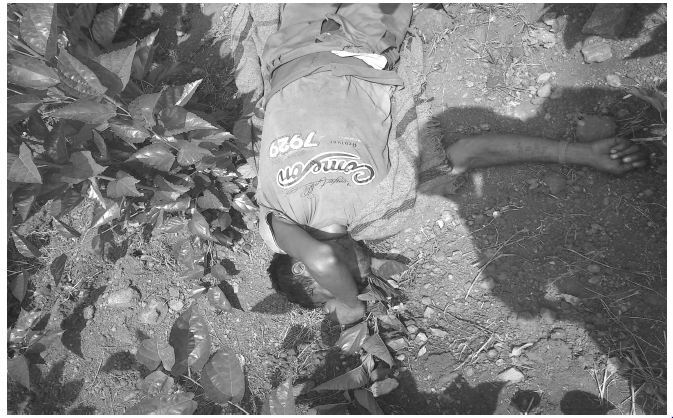 On further enquiry with the investigating officer, it suggested that one day prior to this fatal incidence; the deceased had carried a sharp cutting weapon (sickle) and threatened to cut his throat in front of his villagers. At that moment, the villagers overcome the deceased and prevented him from getting harmed. Also, the investigating officer could elicit the fact that the deceased suffering from diseases and was thus depressed. On external examination, mild subconjunctival hemorrhage noted. Dried blood stains present around oral and nasal region (due to ant bites). A black thread was present in situ over neck. The free ends of the thread (ligature material) were found entangled within the fingers of the left hand. On removing the ligature material, well defined reddish brown dry, horizontally placed, hard, and parchmentised abrasion noted. The abrasion over the neck was wound twice around the neck. One completely encircling the neck and another abrasion was wound 3/4th the circumference of neck with a gap noted on its left side. The abrasions were placed one below the other. A gap was noted for the length of 10cms on the left side of neck and the free ends of ligature material was noted within the left hand (Figure 2). On removing the ligature material from the fingers of left hand, it is observed that two imprint abrasions 4.1cm and 4.5cmX1cm encircling left index and left middle fingers over palmer, outer and back of middle of left ring finger measuring 3.5cmX1cm and 2.5cmX1cm over palmer, inner and back of left little finger. The thumb was spared (Figure 3). 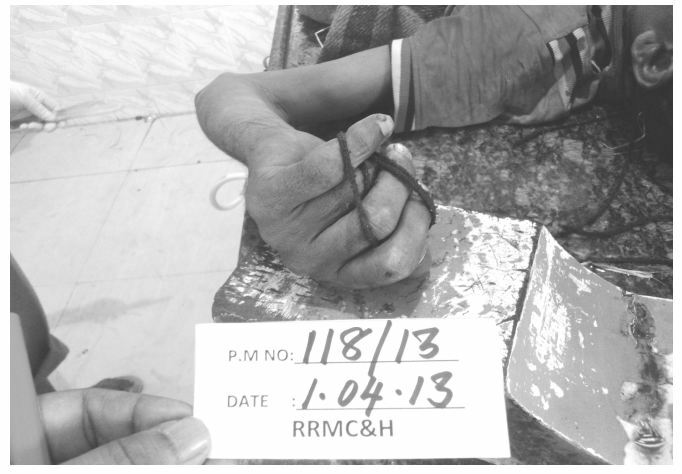 No ante mortem external injuries were seen apart from the ligature mark and over fingers of the left hand. Ant bites were seen at places over the body. Other external appearances were unremarkable. 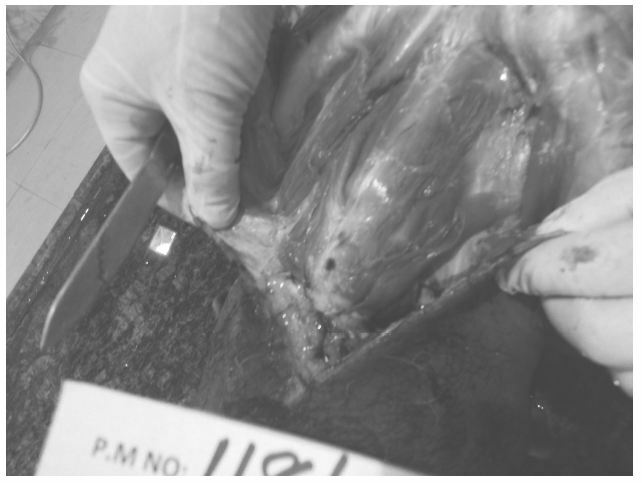 On dissection of neck, strap muscles were intact and unremarkable. Hyoid bone and laryngeal cartilages were intact (Figure 4). All internal organs were deeply congested. Liver was yellowish with feature of multi nodular cirrhotic changes which was later confirmed by histopathological examination as alcoholic cirrhosis. Negative toxicological analysis. Strangulation is defined as the compression of the neck by a force other than hanging. Weight of the body has nothing to do with strangulation . Death by strangulation is homicidal in nature, rarely suicidal or accidental. The distinction between suicidal and homicidal strangulation is very difficult to make, based only on post-mortem examination . Inexperienced investigators hastily conclude that self-strangulation is not possible and thus makes it a suspicious death. This may be true in terms of manual self-strangulation as the constant pressure over the neck cannot be maintained due to loss of consciousness. A rudimentary knowledge of neck anatomy is critical in order to understand adequately the clinical features of strangled victim. The occurrence and degree of mechanical injuries are generally reported to be less marked in suicide, than in homicide—which is consistent with our case . The most striking external finding in the majority of suicidal death by ligature strangulation is the prominent congestion and the massive degree of petechial hemorrhage, which is consistent with the findings in our case . Extensive congestion of the face and head, insignificant hemorrhage of the neck structure, several turns of the ligature around the neck, a ventral or ventrolateral position of the knot, the lack of a clear ligature mark, and the absence of defense injuries all characterize a suicidal action . But Ely and Hirschin concluded that petechiae of the head are the product of purely mechanical vascular phenomena: namely, "impaired and obstructed venous return in the presence of continued arterial input" and that "no relationship exists between the development of petechiae and the presence or absence of asphyxia" . Suicidal neck compression generally has minimal injuries of deep neck structures when compared to the case of homicidal neck compression . Few studies contradict this finding. In a study on suicidal strangulation, the authors found remarkable internal neck injuries like hemorrhages especially surrounding the carotid arteries . As a general rule during post mortem examination, if a hyoid bone is found fractured the death will be a homicide from strangulation until proven otherwise . Fracture of the hyoid bone or the laryngeal cartilages are rarely found in suicidal cases and are restricted to only one broken upper thyroid horn in most instances . A study by Maxeiner showed that fractures of the laryngohyoid structures seen both in homicidal and suicidal cases, although, in suicidal cases, this is rare and usually limited to the upper thyroid horn(s) of the laryngeal cartilage . In our case injury to the neck structures and laryngohyoid structures were absent due to the ligature material being thin and placed well above the laryngohyoid structures. The use of more than one ligature has been repeatedly reported in suicides as well as multiple turns [5,8]. It is very important to examine the knot or other means used to exert pressure over neck and to document its position . In our case, ligature material was winding twice around the neck with a small gap on the left side. Most of the authors argued that the presence of knot, half knots as well as double knots should be present in cases of suicidal strangulation. In our case, constant pressure over the neck was maintained by the ligature which was pulled by the deceased with is left hand. The free end of the ligature was wound around the fingers of his left hand, thus helping him to fix the free ends for a long time. This fact was clearly appreciated during autopsy, by the presence of out stretched left arm and the ligature being wound around the fingers of his left hand. Similar to our case there are only few cases where the authors have noticed that the knot is not necessary to maintain the pressure over the neck, as the ligature were held in place by the hands, or by winding around lower limbs [5,9]. Based on the factors that have to be observed, visit the scene of crime, presence of more than one turn around neck, mode of application of constant pressure over neck, type of ligature material and past history of the deceased are important to arrive at the manner of death. A thorough death scene investigation, meticulous postmortem examination, past history of the deceased, is essential in arriving at the manner of death in cases of ligature strangulation. Concluding the manner of death as suicidal has to be done with precision and upon exclusion of other possible causes. Gross VA, Weiss MG, Ring M, Hepp U, Bopp M, et al. (2008) Methods of suicide: International suicide patters derived from the WHO mortality database. Bull World Health Organ 86: 726–32. Rabl W, Markwalder C, Sigrist T (1992) Self-asphyxia"--a forensic medicine-criminal challenge. Arch Kriminol 189: 1-8. Modi (2006) Medical Jurisprudence and Toxicology. 23rd edition. Lexis Nexis, Butterworths, Wadhwa, Nagpur, India, 575. Vanezis P (2003) Sharp force trauma In Forensic Medicine: Clinical and Pathological Aspects. Greenwich Medical Media Ltd, London 307–19. Knight B (1996) Fatal pressure on the neck. In: Forensic Pathology London: Arnold 361–385. Cartwright AJ (1995) Degree of violence and blood spattering associated with manual and ligature strangulation: A retrospective study. Med Sci Law 35: 294-302. Ely SF, Hirsch CS (2000) Asphyxial deaths and petechiae: a review. J Forensic Sci 45: 1274–7. Maxeiner H, Bockholdt B (2003) Homicidal and suicidal ligature strangulation: a comparison of the postmortem findings. Forensic Sci Int 137: 60–6. Claydon SM (1990) Suicidal strangulation by ligature: three case reports. Med Sci Law 30: 2221–4. Pollanen MS, Bulger B, Chiasson DA (1994) The location of Hyoid Fractures in Strangulation Revealed by Xeroradiography. J Forensic Sci 40: 303-5. Demirci S, Dogan KH, Erkol Z, Gunaydin G (2009) Suicide by ligature strangulation: Three Case Reports. Am J Forensic Med Pathol 30: 369-72. Di Nunno N, Costantinides F, Conticchio G, Mangiatordi S, Vimercati L, et al. (2002) Self-strangulation: an uncommon but not unprecedented suicide method. Am J Forensic Med Pathol 23: 260-3.